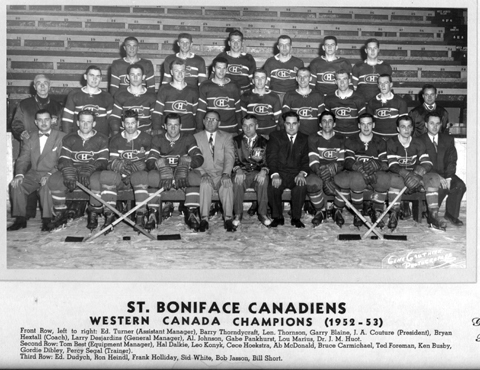 St. Boniface Canadiens won the Manitoba Junior Hockey League championship in 1952/53 sweeping the playoff in eight straight games over Winnipeg Monarchs and Brandon. The team then met Fort William taking that series in five games. In the Western final, St. Boniface beat Lethbridge Native Sons four games to two with one tie to earn a berth in the Memorial Cup final. In the Canadian championship series played at the Winnipeg Amphitheater except for game two that was in Brandon, Canadiens lost to Barrie Flyers in five games.